We’re just finishing up on a couple of pavement re-inspection projects. Project #1 was our 3rd re-inspection of the network and Project #2 was our second inspection of their network. Both projects are located in the Rocky Mountain region of the US and have pretty harsh freeze/thaw cycles, particularly in the past couple of winters. Our clients were mostly interested in how their network was performing over time as compared to our predictive models set up in their pavement management software. The results are pretty interesting for Project #1 – as you can see, their network is deteriorating a lot faster these days based on a few harsh winter seasons. The Bright Green lines show the distribution of their pavement in 2010 as compared to the 2008 (Yellow) and 2005 (Red) inspections. 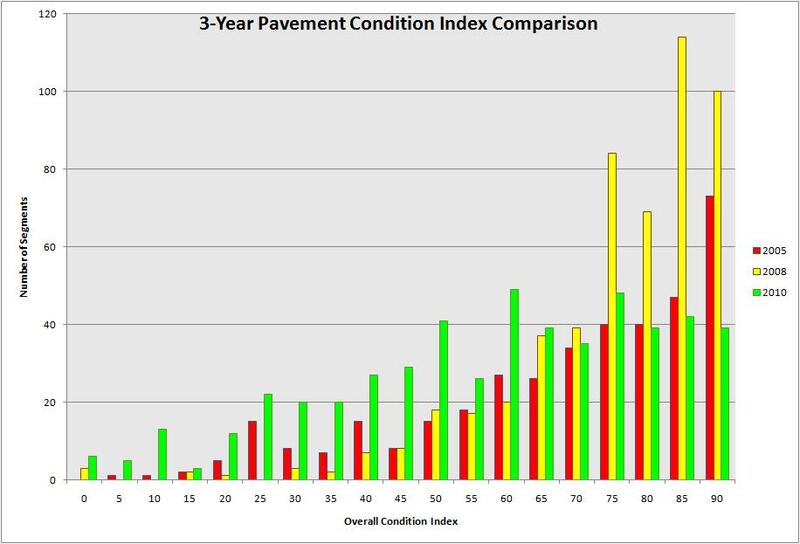 These differences are directly attributable to the past 3 winter seasons and their impact on their pavement infrastructure. This particular client plans on using this information to acquire additional funding for their pavement management program for the next few years to “catch up” with the maintenance on their network. The following graphic displays the current condition distribution for this client for their most recent inspection in 2010. Most pavement prediction models utilize performance curves to predict pavement performance over time. These models hold true in the short-term, but can fluctuate based directly on weather events or other human factors such as changing traffic conditions. In some cases, re-inspection is necessary to adjust these estimates so an agency can fund its capital improvement program effectively. This was the specific intent of this client and there is no doubt why they are one of the premier places to live in because of their proactive asset management approach!